This walk to the Youngsbury Burial Mounds had been on my itinerary since the summer of 2015 when I’d marked the tumuli and earthworks of the Upper Lea Valley and the Hertfordshire plateau on an old Ordnance Survery map. But somehow I’d never managed to get out there. A few days before Christmas seemed like the perfect time, the day after the winter solstice, when the white light slices through the bare tree trunks. “The more eastern of the two barrows is recorded to have been opened a hundred years ago by Mr. David Barclay, the then owner of Youngsbury, and there is a tradition of spearheads, coins, and other objects having been found in it, none of which however are now forthcoming. 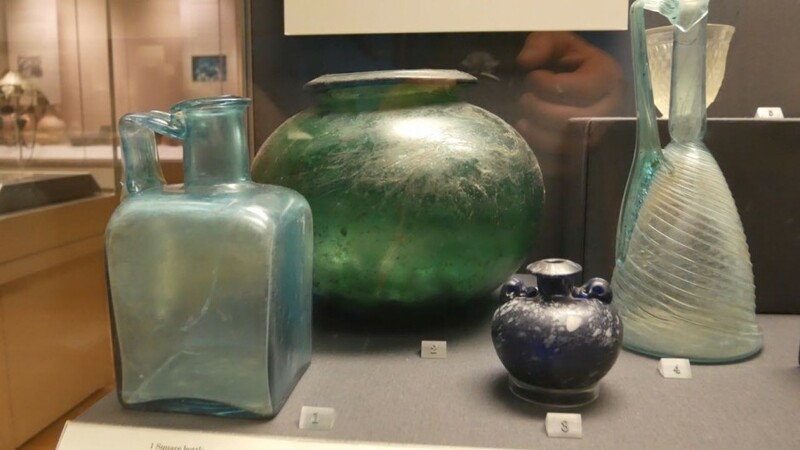 According to Clutterbuck’s account, it was nevertheless Roman pottery and coins that were found in the barrow, which he says proved it to be of Roman origin. Judging from the appearance of the barrow a shaft has been sunk in it from the top, but I am by no means sure that the original central interment has ever been reached. This barrow is of much the same dimensions as the other, the opening of which I am about to describe, and in all probability it belongs to the same period. Both barrows stand at the edge of a field known as the Hilly Field, and are partially overgrown with whitethorns and maples. On my arrival at Youngsbury,, by the kind invitation of Mr. Giles-Puller, on the 11th of June last, I found that a preliminary opening had been made in the upper part of the mound on the south side. At its outer end this cutting extended over about a sixth part of the circumference of the barrow, but its vertical sides converged so as to leave a face about 6 feet wide at what was apparently the centre of the mound, and at this point the cutting was about 9 feet in depth. The diameter of the barrow as nearly as could be judged is 60 feet, and the height about 12 feet above the surface of the adjoining field. Clearing out the loose gravel and soil still further, a magnificent sepulchral urn became visible, lying slightly on one side. It had split into three principal sections and a few smaller fragments, but is in wonderfully good condition, and has been well repaired by Mr. Talbot Ready. 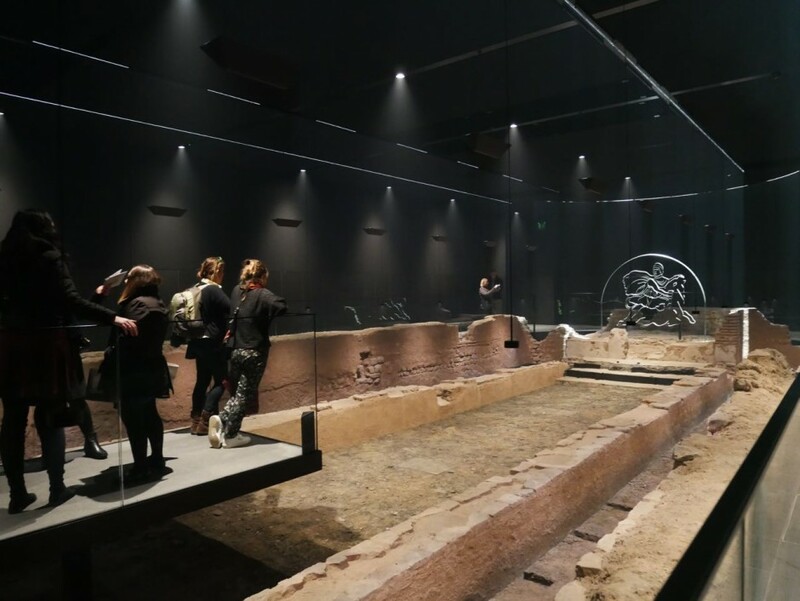 Not only was the walk a magical experience, the power of the location that had inspired the positioning of the mounds still resonating across the millenia. But also my subsequent visit to the British Museum to look for artefacts excavated from similar Romano-British burials. 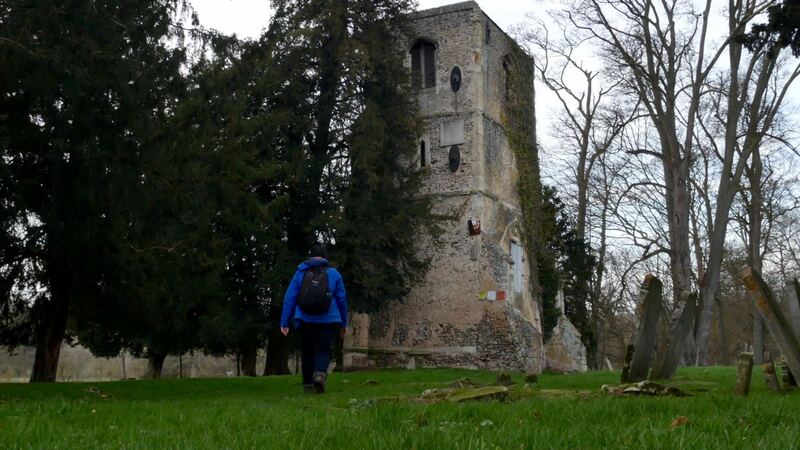 Passing the abandoned church at Thundridgebury added another layer to the expedition and reading reports of the site being adopted by ghost hunters and occultists who perform rituals in the medieval church tower. It’s a deeply storied and beguiling terrain – I’m already planning my next trip. After popping down to photographer Jake Green’s studio in Leyton to pick up the new and expanded edition of his fantastic book, Pie and Mash (containing my essay The Dead Pie Shop Trail), I went on a wander down to Stratford that I’ve done periodically ever since I moving to the area. Somehow this route from Coronation Gardens Leyton, along Leyton High Road, past Drapers Fields, Temple Mills Lane, Leyton Road and Angel Lane to Theatre Royal Stratford East, has been a way of taking the temperature of change in the area from just after the time of the announcement that London would be hosting the 2012 Olympics. This walk and video was inspired by a comment on my YouTube channel, urging me to visit Linder’s Field in Buckhurst Hill. I had to confess I’d never heard of it and in the way that digital maps can deceive you, thought I’d never been anywhere near it somehow. To make more of a walk, I decided to start down by the River Roding, one early afteroon at the end of November, when really the winter should be starting to bite but in reality it was quite mild. The terrain brought to mind my recent discovery of D.W Gillingham’s wonderful book about the Roding Valley, Unto the Fields, published in 1953. “Now I have chosen this November morning to introduce you to the fields because November is the beginning of Nature’s year”. Gillingham writes of the misty, frost covered mornings in November when this winter the frost didn’t arrive until near the end of December. I’m not complaining. Following a stream through a housing estate, remains of Gillingham’s world, I found Linder’s Field on the other side of a footbridge and realised it was the open space I’d seen from the tube a hundred times on the way to Loughton and Theydon Bois and wondered how to reach it. A magical place sealed from the outside world. 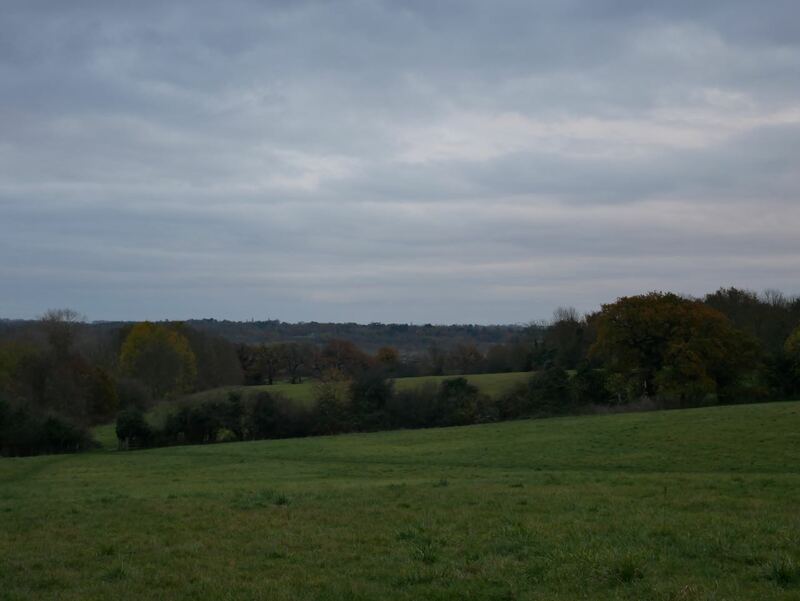 This is the first walk in Patrick Keiller’s seminal film London, shot in 1992, where Robinson and the unseen narrator set out from Vauxhall to walk to Strawberry Hill in Twickenham, which Robinson believes is the birthplace of English Romanticism. My walk took me from Vauxhall Park through Stockwell and Clapham North to Clapham Common, then Wandsworth Common and Earlsfield. I then passed between Putney Heath and Wimbledon Common and through Alton Estate, Roehampton to Richmond Park. This was a route I had to devise based on only a few images in the film – starting at Vauxhall Park – the only other images used in Keiller’s film between there and Strawberry Hill were of Wandsworth Common and Clapham Common. The film features an audio excerpt from a project at Roehampton by my sister Cathy Rogers. After my summer walk around the Royal Docks and subsequent video, a local resident got in touch to say they could show me around Gallions Point and Albert Island. We met one sultry midweek morning by Gallions Reach DLR Station to begin the circuit around ‘the island’. A slogan on one of the developments reads, ‘London is Moving East’, as if this wasn’t part of London and were terra nullius waiting to be claimed. We see the Gallions Point Marina about to be evicted and demolished to make way for the new Albert Island development by the GLA. The planes from City Airport continuously fly overhead and the building of the new runway will increase the number of flights. We also walk through Royal Albert Wharf and see the Riverside development. Two beautiful hidden beaches were visited with incredible views across the Thames. Finally we see the remains of the Royal Pavilion (or Royal Victoria) Pleasure Gardens and the majestic old North Woolwich Station. Many thanks to my local guide.